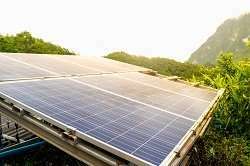 Photovoltaic energy is a clean, renewable and economical source of energy that can help reduce consumption of fossil fuels to mitigate global warming. It provides energy off-grid to remote communities with no electricity or as part of a hybrid energy generation system. Most people without access to electricity live in regions with very good or excellent solar conditions but must pay a disproportionate amount of their income for energy. In Europe, rural, mountainous and remote regions make a significant contribution to the economy. These regions require a low carbon, cost-effective system to support smart grids capable of reducing the development gap between them and urban areas. The Horizon 2020 SUNINBOX project has addressed these challenges and developed a standalone, easy-to-install, photovoltaic generator where all the equipment is configured in the factory ready for use as a portable 'plug and play' system. "All the component parts necessary for generating electricity, like electronic systems, battery packs and the solar tracker can be packed into a standard 20-ft shipping container for easy transportability," says project coordinator Sergio Hernández-Bazan. Currently, SUNINBOX possesses an inverter power capability of up to 90 Kilo-volt-amperes (kVA) to change direct current, DC, power from the lithium ferro-phosphate battery system into conventional mains alternating current, AC, for operating electric lights, electrical devices and so on. "The mixed configuration allows optimal management of the solar resource, both for direct consumption and storage," explains Hernández-Bazan. Project partners employed a highly innovative telescopic solar tracker to orientate the solar panels towards the sun. According to Hernández-Bazan: "A geolocation system allows the tracker to position and deploy the entire photovoltaic field semi-automatically according to its location. This takes less than 10 minutes and the system is ready for use in less than 30 minutes." Researchers developed SUNINBOX with two types of markets in mind. The first is rural areas in southern Europe with high levels of solar radiation and large numbers of farms employing irrigation. "With regards to irrigation, energy represents around 40 percent of total water costs, so water use, and energy costs cannot be considered independently. SUNINBOX therefore represents a realistic alternative for increasing energy use efficiency for irrigation," Hernández-Bazan claims. The second market for the device is remote smart energy grids and rural electrification projects in Africa and Latin America. Here SUNINBOX's portable system can supply power to support local development in areas where solar radiation is very high, but accessibility to the local electricity grid is difficult. To date, energy in such areas is obtained using diesel generators, but now SUNINBOX can lower the cost of energy while producing no carbon dioxide. "In Africa, the cost of energy with our system is EUR 0.3 /kWh compared to more than EUR 0.5 /kWh using diesel generators," points out Hernández-Bazan. The SUNINBOX system guarantees a continuous supply of electricity along with low operating and maintenance costs via a highly efficient portable PV system. The system is 35-45 percent more efficient than its competitors, thanks to the solar tracker, which reduces payback period. Hernández-Bazan concludes: "It is the best option for NGO projects, which need cost-effective, reliable equipment for refugee camps, areas hit by natural disasters, or anyone who has difficulty accessing an electricity grid and/or wants to reduce their carbon footprint." In addition, SUNINBOX will benefit installation companies, as well as companies in general dedicated to the photovoltaic sector. With cheap solar and wind power, is it time to rethink 'energy efficiency'?